Do you care? Kim Kardshian has finally nabbed a guy stupid enough to do the deed with her. The wedding of the century is just around the corner and we have the wedding invitation for your enjoyment. The circus wedding is going to be filmed because of course the whole world wants to see Kim get married, NOT! Rumor has it the cost of the festivities could be as much as $10 million. That would put Kim’s wedding up there with one of the world’s most expensive. 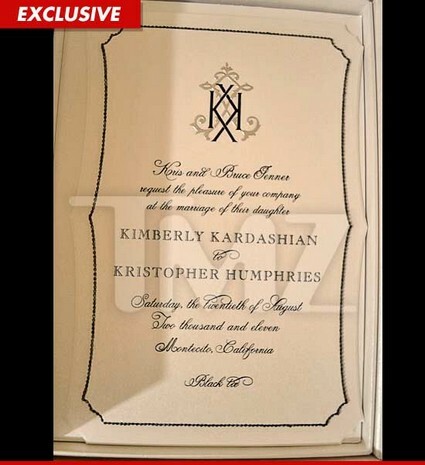 TMZ got a hold of the invites to Kim Kardashian‘s upcoming nuptials to Kris Humphries, thrown, of course, by Kris and Bruce Jenner! According to the invitations, the wedding IS taking place on August 20th and guests have been asked to come dressed in their finest for the black tie affair. The ceremony and reception will take place in Montecito, Calif near Oprah’s house. Wait a second, isn’t she the girl who said she wanted to keep her wedding “as private as we can.” Ya right! Owen Wilson and Jade Duell Planning To Marry?